This tour includes the beautiful Sonoran Desert, the red rock country of Sedona, Oak Creek Canyon and the spectacular Grand Canyon. Step back in time as you travel to the Grand Canyon aboard the vintage Grand Canyon Railway, following the original path of this historic rail line. Please limit luggage to carry-on size only. Any bags larger than 9" x 14" x 22" should be left with your hotel. Travel through the beautiful Sonoran Desert to the red rock country of Sedona for panoramic views and a rest stop. This area has long been known for its fantastic are galleries and wonderful scenery. After your first panoramic overlook, you'll have the afternoon free for browsing or an optional backcountry jeep tour. All aboard! 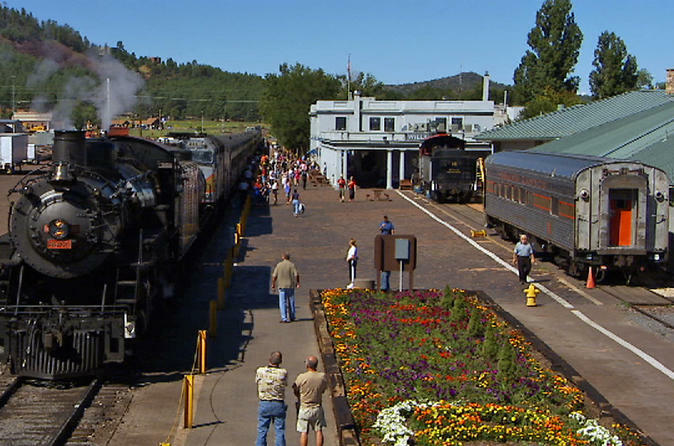 Early this morning, travel to Williams and board the historic Grand Canyon Railroad for a journey through time. You'll enjoy the scenic beauty of Arizona's high country on your way to Grand Canyon National Park. Upon arrival at the Canyon, step up for your first breathtaking view of this Wonder of the World. This afternoon, your guide will take you on a scenic rim tour for fabulous photo opportunities. Today you'll have free time to explore the Canyon on your own. Start your day by relaxing at your hotel, take an optional helicopter flight, or enjoy the IMAX Theatre (additional cost). You'll have until approximately 3:30pm before returning to Phoenix mid to late evening. Please note: The price displayed is based on 4 people in a single reservation. If you require separate rooms you must make separate reservations. There is a maximum of 4 people per room. Room stay can be upgraded based on availability, prices vary. Please note: Luggage Policy ~ One standard size suitcase and one carry-on bag per person ONLY. This policy is strictly enforced. Space is at a premium for guest comfort. Extra luggage cannot be transported. Any bags larger than 9" x 14" x 22" should be left at your hotel.